Aimed at members of the general public, this weekly newsletter contains stunning images of the Universe, the latest science results from Hubble Space Telescope or news about the organisation. Aimed exclusively at media representatives from traditional media outlets, but also bloggers, freelance journalists, TV broadcasters, researchers and movie producers this is a weekly embargoed newsletter, sent 48 hours prior to the publication of press releases. 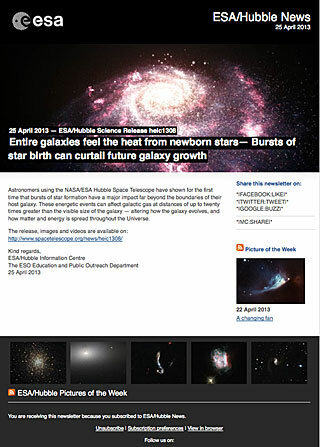 It contains advance access to Hubble press releases and accompanying material such as videos, images etc., the latest videos and footage available for use in documentaries, movies, video news etc. 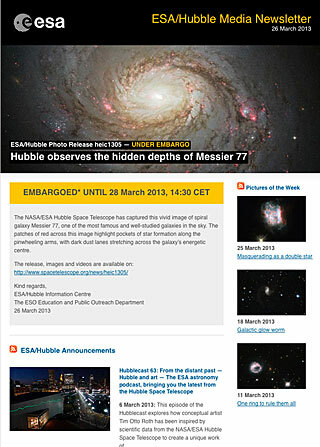 Aimed at the scientific community or anyone interested in more technical and operational news from Hubble, this quarterly newsletter contains calls for proposals, news on observing and programmatic developments, upcoming conferences, etc. 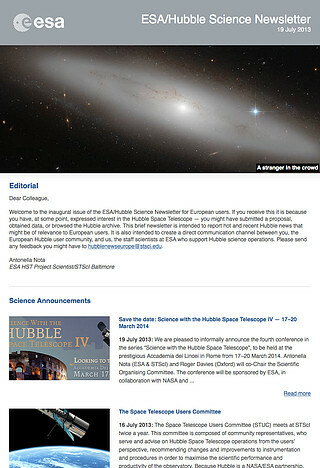 To start receiving the Hubble Science Newsletter, please subscribe here. List of Hubble Science Newsletters.